Why Sikhi? Because Sikhi is a religion you can expand first and foremost it is a celebration in joy. I did not look for the path, the Guru came to me. This year is my 43rd anniversary as a Sikh. As women we are by nature multi-faceted, by nature we have to juggle a number of roles. The Sikh dharma provides us both the tools to do that and encourages us to be enlightened, informed, educated, strong and to inspire others by example. Sikhs do not convert people. I have a lot of difficulties with the word "conversion." If you look around the world and you see how many people have been subverted by conversion and how many ethnic minorities have died because of conversion. This is an abomination . We don't tell people on the street corner that they should wear turbans, it is disrespectful. The Sikh religion is about living within the here and now as a householder. Sikhs don't say that if you don't go up a mountain and live in isolation you are not holy. Sikhi gives us the tools to live in the grace of the Guru and celebrate life, whilst experiencing God . I will challenge anybody in this sangat, because you are the sangat, if you have gone to the Gurdwara and not felt a sense of inspiration, if you have not, talk to me afterwards and I will guarantee you will feel inspired. If you go often enough you will get the message and the message is the Guru is fashioned in love and we are the children of the Guru . We have been given the tools in the Guru Granth Sahib to live spiritually and completely enjoy peace and harmony, the barriers to our growth we erect ourselves and the only thing we need to is to go to the divine counsel - and who is the divine counsel? God! The Guru has given us the tools to do it, provided us with the methodology and all you have to do is to go to the Guru and the Guru provides all the answers . Everything is in the Sikh Dharma, the practice is very scientific, if you do x then y will happen. When you read the scriptures, whatever you do read the Gurmuki, Punjabi or English, recite the Jap Ji Sahib in the morning and the other prayers if you know them, but at least do them and then see how your day goes, see how things flow during the day. 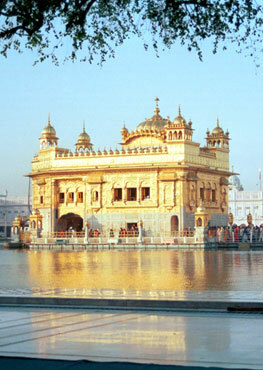 Allow yourself to live in the life of a Sikh and see what it does for you. Don't take it on faith, practice it! I invite you to do it, don't do it because someone else is doing it. Do it for you and that will spread outwards. I am just one person the Guru wanted. Why Sikhi? Because it is relevant in today's world, it was relevant in yesterday's world and it will be relevant in tomorrow's world, because the scriptures are timeless and they always will be. There are no restrictions in scriptures based on gender, ethnicity. Every other religion restricts women. Enshrined in every other religion are restrictions against women. One religion has in its scriptures the method of how to beat a woman when she is disobedient, how many lashes to give. I will not be a member of any religion that did not liberate women. I am a Sikh because the Guru loves me and the Guru presented himself to me because in all my trials and tribulations he held me up and that is the truth. I am a very small being, but I am limitless as a Sikh. Bibi Kulwant Kaur is an author, a qualified Kundalim Yoga instructor, a Natural Therapist and a Counselor.